This problem started occurring around 10.9.0, might have been in earlier version too, but it still exist now in 10.9.2. The sound disappear on the mac after you wake it from sleep mode, but it’s not consistent, there can go days without it happening. There doesn’t seem to be a specific time interval it needs to be in sleep mode, it can occurred with and without headphones or other external audio plugged in. A lot of people has this problem and posted several topics about it on Apple’s forum. There isn’t any official fix for this problem, but there is a workaround by resetting the audio. This solution has been extended a bit so you only need to call one command after setting it up. We create a file which reset the audio, add an alias to .bashprofile which will call the file. When ever the mac comes back from sleep and there is no sound, you can now call rezsound from the terminal and it will reset the sound and it will come back to life. The processor topology specified for the virtual machine cannot be supported by this host. For instance, this can happen when the virtual processor or socket count for the virtual machine exceeds the logical processor or socket count for the host. This was due to number of virtual processor, even though Parallels recommends only using 1cpu since using more is unstable (unsure if the condition has change in Parallels 9, the source was for Parallels 8 http://kb.parallels.com/en/115211 ). Changing the numbers of cpu to 2 still ran Windows 8.1 fine. This was due to allocated memory was only set to 1gb. The recommended size is between 512mb – 1524mb, but 1524 wasn’t enough. Setting the memory to 2048mb will prompt you with “are you sure?”. 2gb ram made it work on the MacBook Air virtual machine with Windows 8.1, the Windows Phone 8 emulator will start and run the project now. Had this problem where Synology Diskstation did not allow to upload a file from the File Station. When pressing the upload button nothing happened. Same in all major browsers. It turned out Java needed to be updated and it apparently wasn’t allowed to run the upload procedure before the update was applied. The UITableView has change in iOS 7, the transparent is turned off, well the cell’s background has a color (white) now. So the background is not visible anymore, resulting in an unwanted tableview look. This is the fix for iOS 7 and will clear the backgroundcolor. This will automatically account for the extra space the navigation bar takes up. 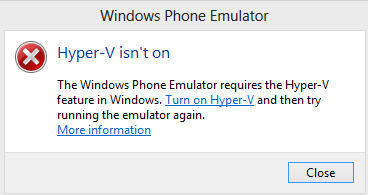 Visual Studio didn’t have the option to select the Windows Phone emulator, this happened after doing a repair of the Windows Phone SDK 8.0 – ENU. It only had the “Attach…” a process to it. The issue here was that the hyper-V wasn’t enable/installed. Either open up the Windows Features by clicking “Turn on Hyper-V” or from Control Panel -> Programs -> Programs and Features -> “Turn Windows features on or off” from the left (blue) menu. Enable Hyper-V and press OK. 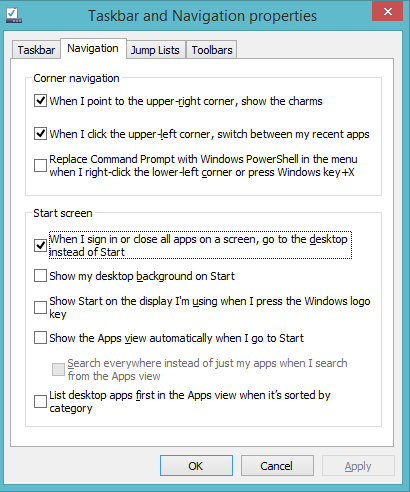 It will need a restart, after the reboot the emulator is in the dropdown menu. Now, there have been several options and solutions depending on what causes the error. “Error: Default activity not found”, almost every line was red and some other irrelevant error. Nothing was changed in the project, only did the update from 0.2.5 to 0.2.6. Build -> Rebuild Project and then restart Android Studio. After updating Android Studio 0.1.6 it sometimes can’t find R and you have to rebuild your project.